Note: If "Check Availability" is indicated for an axe please call (888) 723-3779 to check our inventory before placing your Axe Order. Some Models (In particular the Small Forest Axe) may be on backorder with Gransfors if we have exceeded our quota. Arguably the best axes available, these axes are hand-forged in Sweden to the highest standards by the smiths at Gransfors Bruks. Every axe head is individually shaped under the forging hammers from a special axe steel and then tempered and annealed to the right toughness. Each head is then sharpened, oiled and signed with the smith's initials. Axe heads are fitted to shafts made from select American hickory that has been soaked in hot linseed oil. Gransfors has axes for felling, hunting, carving, chopping, splitting and even throwing. Used by carpenters, campers, log-home builders and home owners, each axe is a wonderful tool designed and crafted for it's intended use and we believe the very best value in cutting tools available. 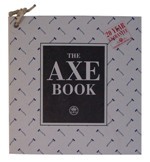 Axe heads come with a 20 year warranty. American Traders offers an axe handle replacement service, should you damage or break an axe handle, you can return the axe and we will fit a new handle for you. Please contact customer service for return information. 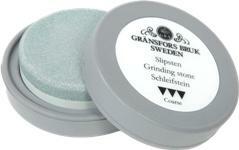 Gransfors ceramic grinding stone is a composite abrasive stone with coarse and fine sides. The coarse side is 180 grit for rough damage and the fine side 600 grit for fine grinding and sharpening. The stone should normally be lubricated with water but can be used dry. The stone is supplied in a protective rubber hockey puck casing which makes it easy to hold when sharpening. Handy, durable and more versatile than a pocket knife. We've been in love with the Mini ever since it was introduced. You can use it for so many tasks, camping, fishing and even in the Kitchen. A lightweight wonder! 2 1/2" face, 10 1/2" handle. Comes with a full-grain leather sheath. A small, light axe which can be easily carried, inside your pack or on your belt. Even with a small hatchet you can easily cut branches and chop & split sticks for a camp fire. The perfect hatchet for camping trips or by the fireplace for splitting kindling.The Wildlife hatchet brings back memories of bygone adventures. The hatchet has a 3" face and a 14" hickory handle, the head weighs 1 lb. Comes with a full-grain leather sheath. A top class limbing axe. The head is forged to a thin curved bit and sharpened to make it suitable for cutting branches in fresh, live and resinous wood. The long handle gives extra strength and power to the cut. The axe has a 3 1/2" face and a 25" hickory handle, the head weighs 2 lb. Comes with a full-grain leather sheath. A professional axe for traditional felling. This traditional American single bit axe could have been seen in any logging camp 100 years ago. The head is forged from a single piece of steel to a curved bit and sharpened to make it ideal for felling. The long handle gives extra power to the cut. The axe has a 4 1/2" face and a 31" straight hickory handle, the head weighs 3.3 lb. Comes with a full-grain leather sheath. Keep this hatchet right next to the fire place. It's perfect for splitting pieces to get a fire going. The hatchet is easily managed with one hand. The head is forged and ground concave, to a very sharp, thin blade at the bit. This design helps the axe to go fast into the wood - and then split efficiently when the thicker part hits and pushes the wood apart. The axe has a 2 1/2" face and a 19" hickory handle with circular grooves at the grip and steel collar near the head, the head weighs 2.5 lb. Comes with a full-grain leather sheath. Designed for splitting chunks of wood. The axe head is quite heavey with forged cheeks on both sides and ground concave, to quite a thin blade at the bit. This design helps the axe to go fast into the wood - and then split efficiently when the thicker part hits and pushes the wood apart. The poll of this axe is not designed for pounding on a wedge. The axe has a 3" face and a 27" hickory handle with circular grooves at the grip and steel collar near the head, the head weighs 3.5 lb. Comes with a full-grain leather sheath. The ultimate spliting tool, designed for splitting apart large chunks of wood, "rounds". The Maul's head is heavier and the cheek flare wider behind the cutting edge than the splitting axes. The poll is designed for use hitting a splitting wedge. The axe has a 2 1/2" face and a 31" hickory handle with circular grooves at the grip and steel collar near the head, the head weighs 5 1/2 lb. Comes with a full-grain leather sheath. A forged steel splitting wedge that is twisted for maximum splitting efficiency. The poll has ground edges. The wedge has a 1 3/4" face, and weighs 4 lb. Comes with a leather cover. The carpenters axe has a straight edge and thin blade with a low angled bevel. The axe is suited for work in dry wood. The forged inward curve from the heel to the lip of the head allows your hand to grip close to the center of the edge. The long straight cutting edge, gives rigidity, stability, and good control when cutting. The axe poll is ground flat and can be used as a hammer. The axe has a 3 1/2" face and a 18" hickory handle, the head weighs 1 1/2 lb. Comes with a full-grain leather sheath. A carving axe for artistic wood sculpture, hewing bowls, wooden objects and architectural work. The curved shape of the cutting edge, carried well above the handle, the position of the edge in proportion to the handle, the thicker bit and the big angle of the wide beveled face make this axe a good carving tool. You "cut on the beveled face" with curved movements. This new axe pattern, based on old Swedish carving techniques was developed by Wille Sundqvist, master craftsman and author of Swedish Carving Techniques. The handle is "rugged" to give a good grip. Available special order with left or right bevel and carved handle. The axe has a 4 1/3" face and a 14" hickory handle, the head weighs 2 lb. Comes with a full-grain leather sheath. 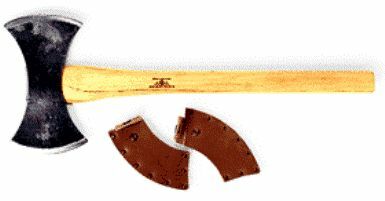 The Swedish Broad Axe is patterened on an historic design used for hewing, squaring logs and structural timbers for construction. The head is forged so there is sufficient space between the blades 'beard' and the handle for the users fingers. The straight axe is available double beveled (on both sides) and bevel on left or right. Standard configuration is both sides #4801. The axe has a 7" face and a 20" hickory handle, the head weighs 3 lb. Comes with a full-grain leather sheath. The Swedish Broad Axe is patterened on an historic design used for hewing, squaring logs and structural timbers for construction. The head is forged so there is sufficient space between the blades 'beard' and the handle for the users fingers. The angled axe has the eye and therfore direction of handle angled sideways to protect the knuckles when cutting. This left angled axe normally has a single bevel to the right #4812, but may be ordered with a double bevel #4811 and bevel to the left #4813. The axe has a 7" face and a 20" hickory handle, the head weighs 3 lb. Comes with a full-grain leather sheath. The Swedish Broad Axe is patterened on an historic design used for hewing, squaring logs and structural timbers for construction. The head is forged so there is sufficient space between the blades 'beard' and the handle for the users fingers. The angled axe has the eye and therefore direction of handle angled sideways to protect the knuckles when cutting. This right angled axe normally has a single bevel to the left #4822, but may be ordered with a double bevel #4821 and bevel to the right #4823. The axe has a 7" face and a 20" hickory handle, the head weighs 3 lb. Comes with a full-grain leather sheath. Double bit felling axes have been popular for over 100 years because of their balanced feel and versatility. This is a supurb working axe with both bits sharpened to a finely honed felling edge. The long handle gives extra strength and power to the cut. The axe has a 6" faces and a 35" hickory handle with swell knob, the head weighs 3 lb. 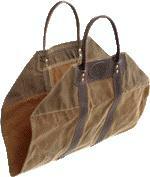 Comes with 2 full-grain leather sheaths.